What if you were supposed to die, but you didn't? And what if, years later, your precious second chance didn't turn out anything like you thought it would? 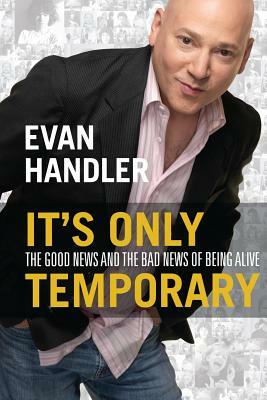 That's the journey Evan Handler experiences, and the one he explores in It's Only Temporary: The Good News and the Bad News of Being Alive. In a collection of funny, offbeat, and poignant autobiographical essays, Handler moves beyond the supposedly "incurable" illness he triumphed over in his mid-twenties--only to tumble through his thirties and forties in search of ever elusive love and happiness. Picking up ten years after his first book, Time on Fire, Handler again uses what the New York Times calls his "laceratingly funny and revealing" storytelling skills to weave twenty-one new tales into a defiantly unconventional memoir. Consistently witty and insightful, Handler's stories shift effortlessly from the comedic to the profound, musing with equal intensity on the existence of God and his experiences with TV stardom. Then, just when it seems he's failed to make the most of his astonishing second chance, Handler finds his way to miracles even greater than the ones that saved his life. His memoir describes his journey from darkness to light, from yearning to gratitude, and in so doing succeeds as both a stirring love story and a classic coming-of-age tale. It's Only Temporary celebrates the transformation of a boy to man--even if it look Handler more than forty years to get there.